As a mother to three little ones - two of whom can't yet crawl or walk, I am often in search of two important things in my day. The first is a good caffeine hit. The second thing is how to get that caffeine hit, without having to unload the three small people from the car, get the coffee, then load the three aforementioned small people back into the car, while juggling the prized coffee. Unlike some other states around Australia, Brisbane is still getting into her stride when it comes to an easy-to-pick up or drive-through take away coffee (I am not going to include a certain international fast food corporation who don't make custom-made coffees available through their drive-through service anyway, in this article). But there are some good drive through cafes around, with more on their way. So where is the best and easiest places to get a coffee around Brisbane where you don't have to leave your car? With a full hot and cold drinks menu, Zaraffas drive-through coffee is an easy place to get almost any sort of caffeine or chocolate-inspired drink you could hope for. Drive-through venues include Nerang, Toowoomba, Pacific Pines, Worongary, Warwick, Loganholme, and Maroochydore. A 'coffee fusion' on a hot day is just the thing. A great little coffee shack, Muzz Buzz has made its long-awaited foray into Queensland. They may make great hot and cold drinks, but I can never resist the donut-hole-like 'Buzz Balls' or grab one of the (albeit limited) choice of sandwiches. Muzz Buzz is located on Kingston Road in Slacks Creek. 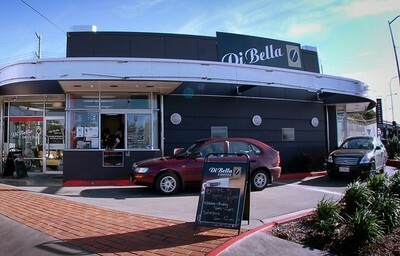 If you love Di Bella coffee, you'll love the Di Bella coffee drive through on Abbotsford Road in Bowen Hills. This was the first drive through coffee venue in Brisbane and some would say, still the best. They make a good cappuccino. While not strictly a drive through, you can practically yell your coffee orders from your window into theirs. Coffee on Corso in Seven Hills is a hole-in-the-wall style coffee venue, with parking or cars' standing spots out the front. They do a great mocha. Another Di Bella coffee haven, this 'coffee cart' is positioned on two cark park spaces outside a butcher, bakery and fruit shop on Stanley Road, Carina. Pull up in the next bay and place your coffee order, or grab one of their delicious sweet treats. My favourite is their Brownie or maybe the melting moments - either (or both) go great with a coffee. There are new easy-to-get or drive-through coffee places popping up around Brisbane. Do you know of any others? Other places where drive up (but not drive through) coffee can be found are Ave Cucina on Eva St coorparoo & Stomp Espresso on Holland Rd Holland Park. Great drive through coffee is available daily from a cart sent up in the drive through bottle shop of the Sunnybank Hotel cnr Mains Rd & McCullough St Sunnybank. Silver Joe's is a funky little coffee van at Freedom Fuels on Moggill Rd, Indooroopilly (corner of Taringa Pde). Very handy inbound to the city.. Text orders ahead on 0439 160012, 6-11am weekdays, 7-noon Sat. Fast friendly service and great coffee, retro prices too! These are some great ideas. What is kickstart? There is also a drive-thru coffee "stall" on Mains Road, Sunnybank every morning (except Sunday, I think). It is located beside the drive through section of the Sunnybank Hotel. There's a little hole in the wall type place on Ridley St in Auchenflower, just off Milton road. Awesome coffee - he doesn't charge for soy which I LOVE, and there's almost always a park right out the front. Text ahead 0403 363 018 and drive by pickup fabulous Merlo takeaway from Clarence Corner Book Shop and Cafe on Stanley Street, near Mater, on the way to city or inner south brisbane, weekday mornings from 6.30 a.m. Pull in and pickup parking out front at all times, including peak hour! More people should try this! I love the idea of coffee drive through. At Lash Cafe (Wynnum Road/ Norman Park) you can text your coffee order through in advance for a quick pick up. kenmore park and ride 5.30-9.30 there is a mobile expresso bar with seating called My Coffee Box - amazing coffee !!!! Then goes outside moggill state school till 12.30.